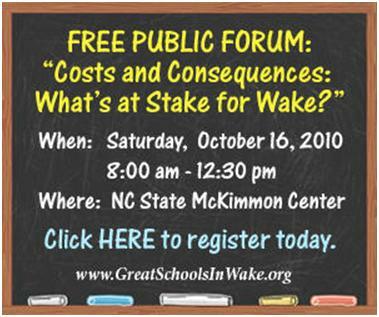 For those trying to make some sense of what the heck is going on with the Wake County schools in light of last night’s wackiness, you would be well-advised to attend the Great Schools in Wake Fall Forum scheduled for next Saturday, October 16 at the McKimmon Center in Raleigh. The event will run from 8:00 a.m. to 1:00 p.m. and will be designed to help spur the county out the disastrous “circular firing squad” approach school board members have been pursuing in recent months. Be sure to tell your friends and spread the word about the event.